Post Processors are a key step in Offline Programming because they can generate robot programs for a specific robot controller. Robot programming must follow vendor-specific programming rules, these rules are implemented in the post processor. A robot post processor defines how robot programs must be generated for a specific robot controller. The conversion from the RoboDK simulation to a specific robot program is done by a Post Processor. Each robot is linked to a post processor which will define a specific robot programming style. 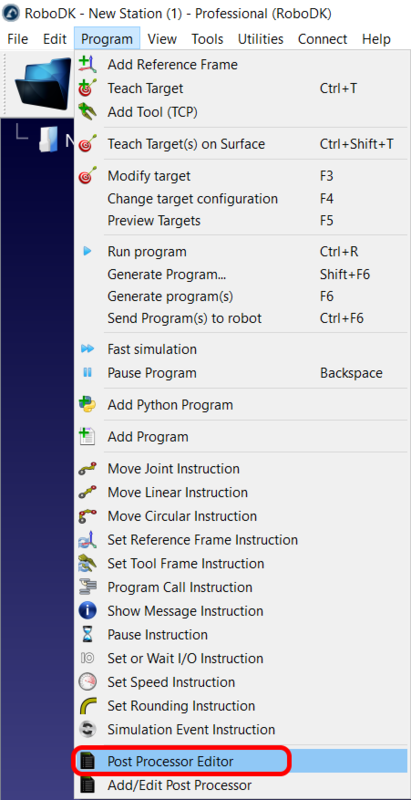 The post processor is used when the program is generated offline, as shown in the Generate Program section (by right clicking a program, then, selecting Generate Robot Program). One post processor is a PY file (each post processor is defined by a Python script). It is possible to manually add, modify or delete the files in the Posts folder of RoboDK. If you have been provided a RoboDK post processor (PY file) it should be placed in the Posts folder so that it can be selected from RoboDK. Note: Most robot brands have different controller versions. It is important to select the right post processor to generate appropriate robot programs supported by a specific robot controller. Important: Each robot has a specific post processor assigned to it by default. The default selection might not generate appropriate programs for a specific robot controller. In that case it is required to select the post processor for the right robot controller. Note: The selection of a Post Processor is linked to a specific robot. Changing the post processor of a program will update the post processor for all programs linked to the same robot. 3. Select your post processor in the Robot brand box, as shown in the following image. Tip: It is possible to quickly preview the output of each post processor by double clicking its PY file in the C:/RoboDK/Posts/ folder. More information available in the next section. It is possible to modify existing post processors or create new post processors. 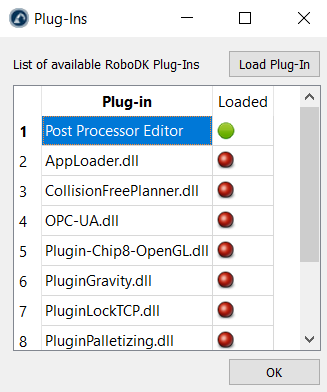 Post processors must be placed in the folder C:/RoboDK/Posts/ so that they can be selected in RoboDK. The previous section describes how to link a specific robot to a post processor. Each post processor is one PY file. It is possible to rename the file or copy files from/to the C:/RoboDK/Posts/ folder to share different post processors. To delete an existing post processor script, simply delete the corresponding PY file in the Posts folder. Post processors can be edited using any text editor or a Python editor (Python IDLE). Using the Python editor allows to quickly debug and evaluate a sample program at the end of the file. Video: Overview of post processors: https://www.youtube.com/watch?v=lbycCDjtOnE. Python should be installed to test and use the post processors properly (Python is installed by default with RoboDK). 3. Select OK. A text editor will open and the program. Run module (F5) to preview the result. Make any changes if necessary. Run module (F5 by default) from Python IDLE. Alternatively, it is possible to edit this file using a text editor and run it with Python by double clicking it. Other and providing the editor path in the Python editor command. Important: If a text editor such as Notepad++ is used, it is important to replace tabs by 4 spaces. Otherwise, we will get a TabError saying that there is an inconsistent use of tabs and spaces in indentation. 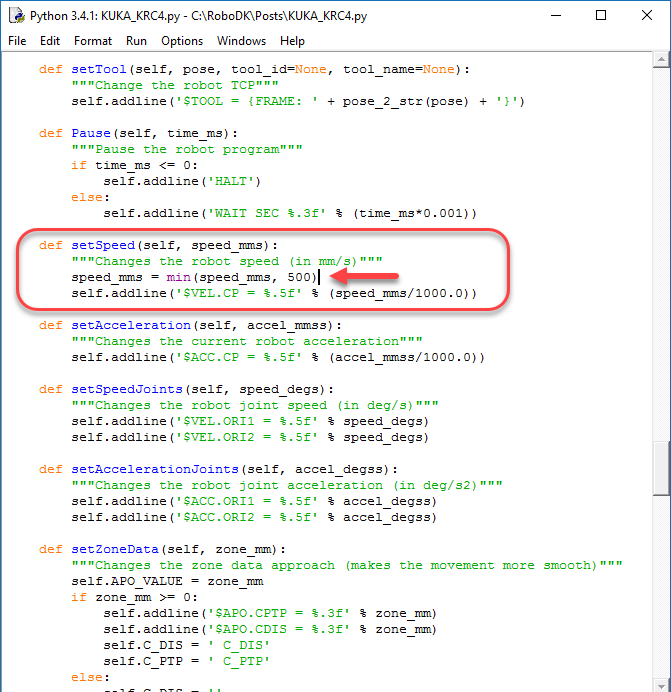 This section shows how to make small changes for an existing post processor. Most post processors have some variables that can be easily modified to modify or activate vendor-specific robot programming features. ● Set a joint movement to generate the motion command using joint angles information. ● Override the maximum speed to 500 mm/s. Even if the robot is programmed to move faster, the speed will be limited to 500 mm/s in the post processor. ● Generate each program as a separate file and force programs to have 3000 lines of code per program at most. Large programs will be divided into smaller programs and called sequentially. 2. Select your post processor. 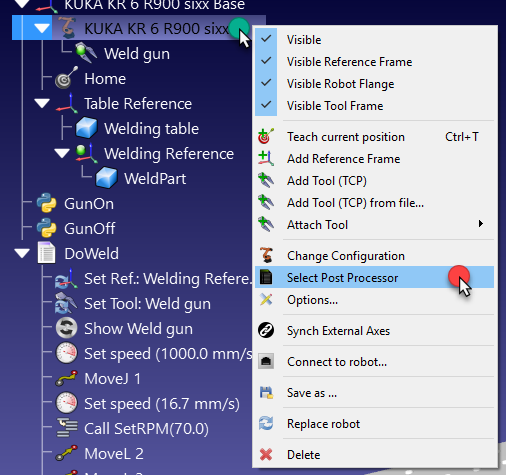 For example, for KUKA KRC4 select KUKA_KRC4. 3. Select OK. The post processor will be shown in the Python IDLE editor. The following sections show how to make the suggested changes on a text editor (or Python IDLE). The following steps show how to modify an existing post processor to force an axial movement using joint angles. In this example we show how to apply this change for an ABB IRC5 robot controller. 1. Find the programming manual of your specific robot controller. In this example we use the ABB IRC5 RAPID programming manual. 2. Look for the joint movement instructions. In this case, ABB’s absolute joint movement command is called MoveAbsJ. This command requires a jointtarget variable that defines the joint axes. Add/Edit Post Processor and select the post processor you are currently using to modify it. If you are currently using a customizable post processor it will be selected by default. 4. You should look for the MoveJ function inside the post processor. 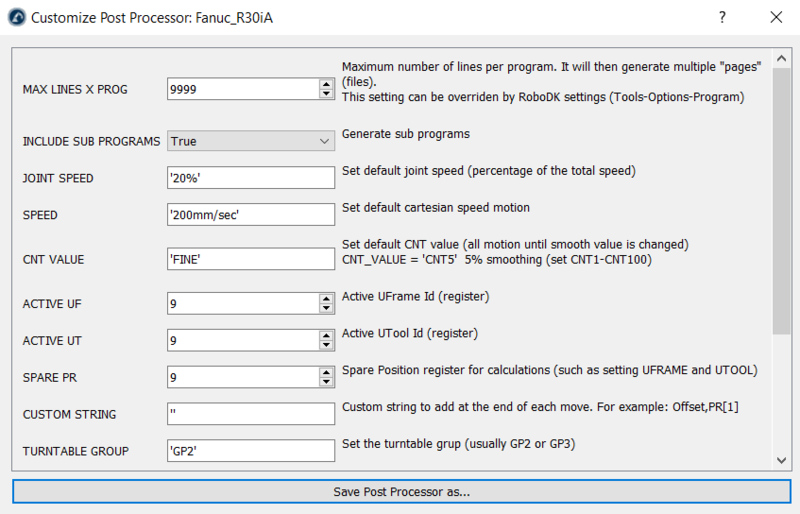 This function defines the way post processors generate the joint motion commands. Alternatively, RoboDK uses MoveL for linear movements. Using Python programming language, modify the line that is added to the program file to provide joint angle information, as shown in the following image. 5. Finally, you may need to modify the way the post processor converts the joint angles or the pose to a string. The functions angles_2_str and pose_2_str define how the joint angles and a pose, respectively, is converted to text. Most RoboDK post processors use joint data for joint movements and Cartesian coordinates for linear movements. It is recommended to always start the first point in a sequence of linear movements as a joint movement, specifying joint coordinates. This avoids starting a program with the wrong robot configuration and reaching a singularity or axis limits. Note: All RoboDK post processors link to the robodk.py module by default. This module includes useful tools to convert from poses to Euler angles for many robot controllers. Use the notation corresponding to your robot controller. More information available in the Reference Frames section and the robodk.py module. Important: If you specify a movement using a pose (for example, using cartesian coordinates and Euler or Quaternion information), the position that the robot will attain will depend on the active tool and reference frames. The poses of the tool and reference frames must be properly specified in the program. This is done through the setTool and setFrame functions respectively. Note: A default speed of 200 mm/s is defined in the HEADER variable, at the top of the post processor ($VEL.CP=0.2). This default speed can also be changed if the speed is not modified from RoboDK. 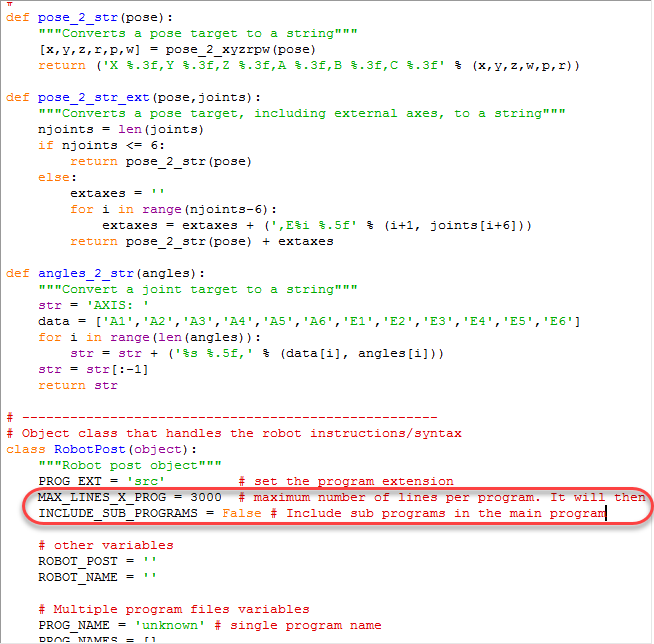 Note: The variable MAX_LINES_X_PROG may be overridden if the maximum lines per program is specified from the RoboDK Program Options menu. Modify the __init__ section of the post processor to avoid changing this variable from the RoboDK settings. The robodk.py module provides tools for pose operations (multiplications, inverse, …) and conversions between poses to Euler angles in different formats, among other things. 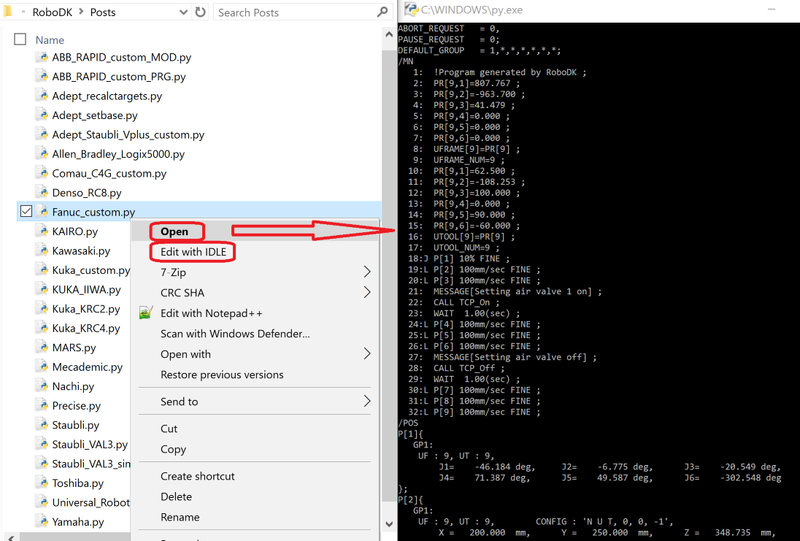 Note: By default, Python is installed with RoboDK and the robodk.py module is added to the Python path. 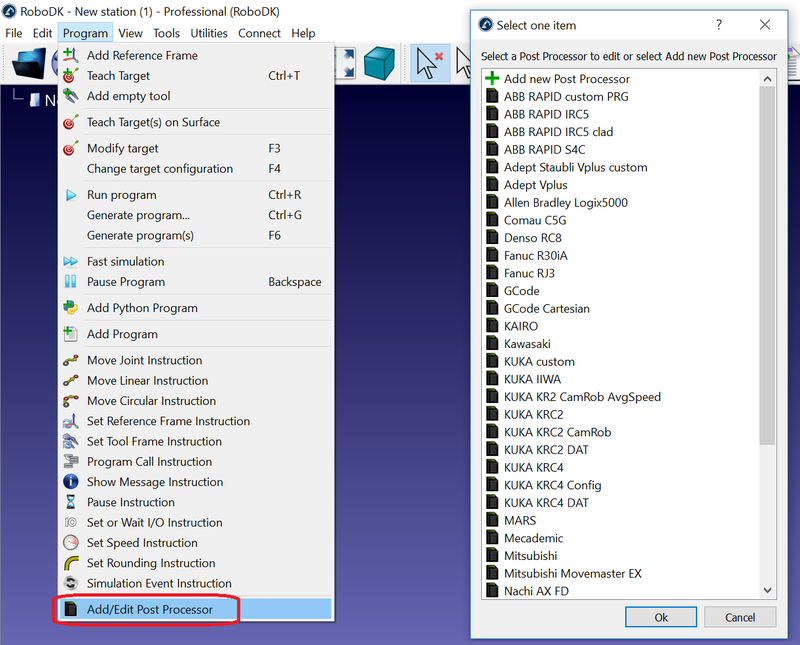 When a program is generated, a preprocessed/universal Python program is generated and saved in a local temporary folder. 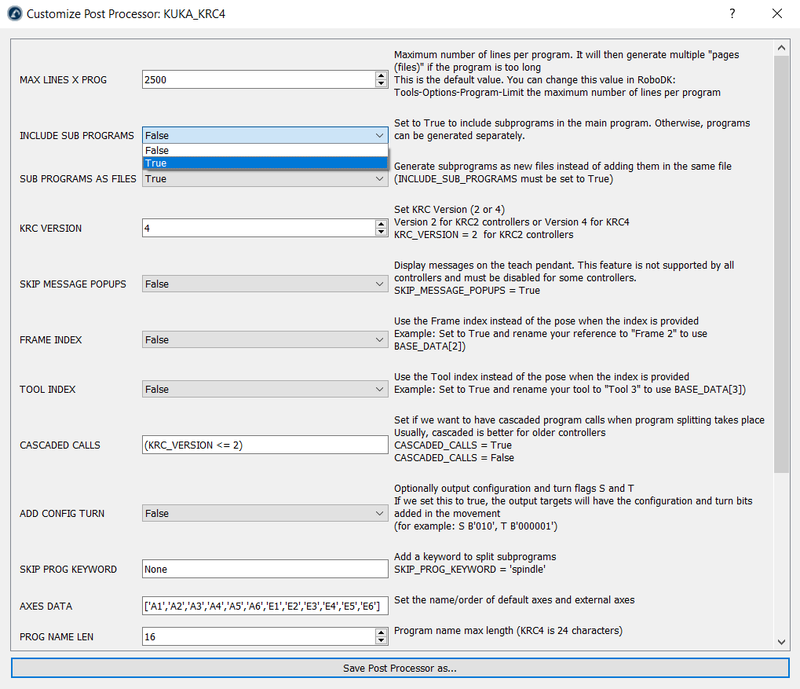 The preprocessed program is linked with the right post processor (selected by the user in RoboDK). The post processor defines a RobotPost class that generates the desired code. The precompiled programs are executed with Python. 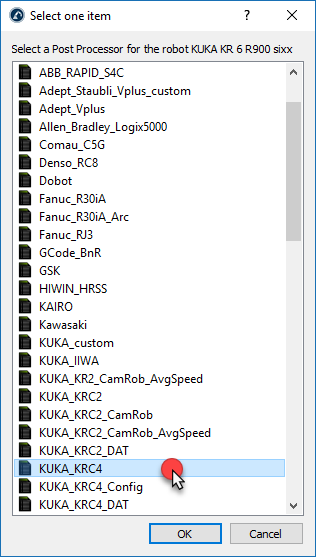 Tip: On Windows, the preprocessed programs are saved in the C:/Users/username/AppData/Local/Temp folder (type %TEMP% in windows file explorer). These programs can also be used for debugging new post processors.